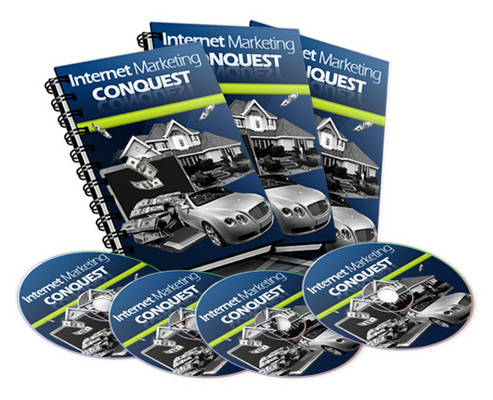 The Internet Marketing Conquest program has been designed to help you maximize your traffic and your profits with simple but clever techniques that you'll wish you'd have thought of. With this program you will be able to change the direction of your business very profitably and who knows how much you will profit from this information? Closely Guarded Information Revealed In Detail - The Internet Marketing Conquest program will reveal in step by step format this closely guarded information to help you massive increase your profits. * Video 2 - Ninja Spinning - 16:26 - Watch this video if you want to get more bank for your buck when it comes to content. Learn how to create highly unique articles rapidly - maximize use of your PLR articles! * Video 3 - Ninja Keyword Research - 12:04 - Learn how to find profitable keywords in minutes all for free. Plus see my secret source of niche research that instantly reveals profitable niches. * Video 5 - Ninja Video Marketing - 08:21 - Learn some ninja techniques for massively increasing your video views and traffic to your sites. * Video 6 - Video Submission Tool - Learn how to submit your videos to many sites with a click of a button. Benefit from backlinks and traffics through this simple and free technique. * Video 7 - Ninja RSS - Want to know how to massive increase your backlinks with the click of a button? Learn how you can attract search engine spiders and backlinks rapidly. * Video 9 - Ninja Networking - 12:39 - Learn why networking is so important and where the best places to network are. Discover how you can increase your profits massively just by talking to people. * Video 10 - Building Passive Income - 06:31 - A passive income will set you free. Blow your mind with the concept of being paid not to work! * Video 12 - Dominating The Most Published - 14:13 - Learn how to super charge your traffic by dominating the most published (and most viewed) lists at top article directories. See how you can massively increase your traffic for literally pennies!